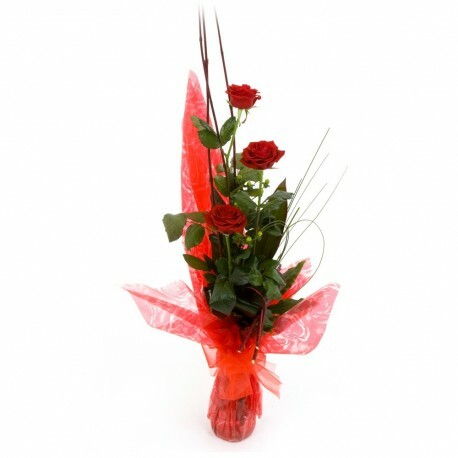 A beautiful 3 red rose arrangement perfect for the Valentines occasion. Three gorgeous long stem red roses arranged with coordinating glossy green foliage in a glass vase. Sent with water to keep the glories blooms fresh and hydrated this is the perfect gift for your valentine. Adding chocolates or a balloon is an available option. Have this item delivered to their place of work or hom for a valentine’s day surprise they won’t forget! Want different colours? Just get in touch and we will work with you to provide the perfect gift.